It only happens every other year, so you'd think there be a bit more of a buzz about the nation's major exposition of all things natural stone, especially in the light of the alleged recovery and wide-scale use of natural stone in so many of our town and city centre revamps, but it all seemed a little too subdued at last week's Stone Show in London's ExCel. While there were quite a few British stone companies exhibiting their offers, those absent from the show were almost as noticeable. Each stone show, regardless of where it is held, be it Britain, Europe, China or North America, has two strands. There are the exhibitors who could be at any stone show, the international brigade, if you will, who tour the world flogging their machinery or their stone, but give no local flavour to an event. And then there are the exhibitors who are effectively flying the flag (no pun intended) for the host nation, the ones who provide that sense of just where you are, and offer that special something that cannot be found at any other stone show, that very quintessence of a nation, the rock upon which it is founded. So massive plaudits to those British stone companies who did make the effort at London, and more about them later, but some of the biggest names in the industry need to think long and hard about their strategy and the way they sell both themselves and their stone. It seems wrong to bang on in the brochures about the native stone a company "proudly" produces, but then fail to show it at the national showcase. Oh, I know it costs silly money to exhibit, but if companies with sales levels one-hundredth of what the big boys achieve can make the effort, why can't the major players? Why don't they take the opportunity to show the world what Britain, and Ireland, has to offer? And that's a question as much for the show organisers as it is for the missing names. One of the nicer Portuguese granites on show It's also disappointing to report that not one Irish stone producer was present, either. In the heady days of the Celtic Tiger economy, Dublin had its own stone show, but since the tiger scarpered back to the jungle taking all the money with it, the Irish trade has relied quite heavily on the British show to reach a wider market and British customers to provide much needed demand, but in 2015, nothing, or neamhní, as we say in gaelic. Also missing were the importers, the dozens of medium sized businesses who have made a good living out of bringing overseas stone into the British and Irish markets. If you look back at previous stone shows, you could hardly walk more than a few metres without tripping up over one or other of them, but in 2015, they, too, are conspicuous by their absence. So: who was there? Who put in the effort, who made the long trek to the London Wastelands, and did they have anything worth seeing? Despite all of the above, there was a reasonably strong and catholic representation of the stone industry in Britain, from walling to paving, from tools to jointing, and a goodly selection of education and training opportunities. For the paving stone, show regulars, Johnsons Wellfield, had yet another crisp and clean display of the eminently creamy Crosland Hill yorkstone in a wide range of formats. Many years of exhibiting have taught sales manager, Michael Gorman, a host of tips and tricks that allow him and his team assemble a pristine display with minimal effort, and it all fits together seamlessly. The stone is more than capable of speaking for itself, but this compact presentation really doe show its full potential, from tactiles to walling, setts to sills, and so much more. I completely missed Caithness Flagstone and I'm really annoyed at doing so. I did wander past on a few occasions but the small stand was always knee-deep in admirers, and not wanting to interrupt a possible sale, I sailed past hoping the crowd would have thinned on my next pass, but it was never to be. Caithness has been attracting a huge amount of interest over the last decade or so, especially following its extensive use in the Titanic Quarter of a rejuvenated Belfast, so I had wanted to hear more about future projects. I do hope I don't have to wait another couple of years before getting the opportunity again. Flamed Blue Pennant Forest of Dean Stone Firms had what should be regarded as significant news in that extensive burrowing into deepest Gloucestershire has revealed lovely new beds of a really hard blue Pennant stone that is capable of being flamed, bring a whole new texture option to their already gorgeous stone, and this is bound to attract attention from the local burghers in southern and western England who have readily adopted the Pennant for impressive street schemes over recent years. Just a pity that no-one on the stand seemed to want to talk about it in anything but the most cursory terms. Lovell Stone Group has grown and grown, encompassing what seems like ever more of the prestigious quarries of southern England. They put some delicious Chicksgrove limestone into a Chelsea garden last year which seems to have reaped significant rewards for them, and with a new Bath stone due next year, things can only get better. I know a lot of their output goes into vertical masonry, but they still put down enough in the horizontal to keep my interest piqued, and none more so that the lovely cabochon effect panel on show here. Meanwhile, in the north of England, Stone UK have been carving a niche for themselves by supplying quality new and reclaimed yorkstone along with an eclectic range of other native and imported stones that offer something that little bit different. 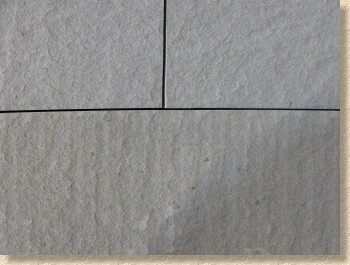 I was quite taken with the brushed riven yorkstone, which relies on technology to reproduce in hours the effect that usually takes decades of wear by thousands of feet. Brushed riven yorkstone from Stone UK Company boss, David Evans, is also proud of their new range of dedicated cleaners and sealers, each produced specifically to work with natural stone. He's confident they are as good as anything else on the market, if not better! They'll be a candidate in the pavingexpert sealant trials scheduled for later this year so that will show whether that confidence is warranted. RR Stone are even further north, on the edge of the Lake District near Windermere, and few people have an eye as keen for stone as Richard Rogers. His latest find is a stunning Vietnamese dolomitic stone that is a dead ringer for the vaunted and much-admired green Kirkstone Slate. Shimmering shades of greens and greys that twist and bubble with interest, it is, for me, the best thing I saw at the show. And when he tells you the price…..well, don't say you weren't warned. How he can sell it for such a bargain price is beyond me, but I just wish I had a project where it could be used. It's been dubbed "Moorland Green" – look out for it, you won't be disappointed. Moorland Green from RR Stone - the indoor lighting does not do it justice! Albion Stone are, arguably, the nation's premier supplier of the famed Portland Stone, and I really shouldn't have to explain the significance and importance of Portland stone. It is *the* building stone of regency Britain, and when you see the display they put on here, you can understand why it is such a popular material for projects of note. Just bloody gorgeous, and delight to work with, as countless generations of stone and street masons have found. Another famous name would be Great Tew Ironstone, a quarry that forms part of the Johnston Quarry Group and widely used throughout the west of England. Very strongly coloured, very distinctive and very attractive. It is primarily a building stone, although I have seen it used for internal flooring and, in one case, an external patio, but I'm not convinced that is its best use. To me, the Great Tew and its sister quarry at Oathill are the colours of Oxfordshire. 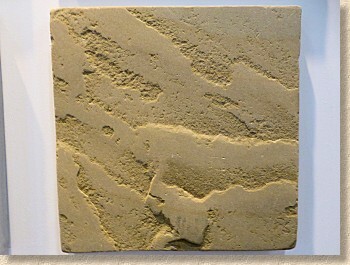 And in much the same way, the Stoke Ground stone from Bath Stone Group is synonymous with what we tend to think of as the West Country. Another building stone but so redolent of that part of the world it brings happy memories of one of my favourite haunts. Finally in this brief survey of the indigenous stone supply industry comes Trade Price Stone, which seems to have a supermarket style approach to imported stone. 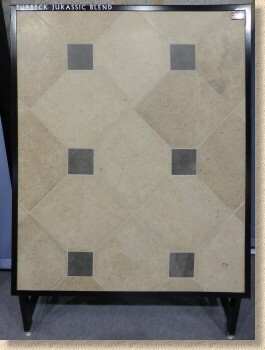 If it's a popular import, they will have it, and often at a discounted price, There's all the usual suspects: sandstones and limestones from India, Brazilian slate, Turkish travertine…but nothing to get really excited about. I know from the enquiries that flood in via the website that there are plenty of customers out there looking for a bargain, and maybe Trade Price is for them, but for me, quality will always come first. 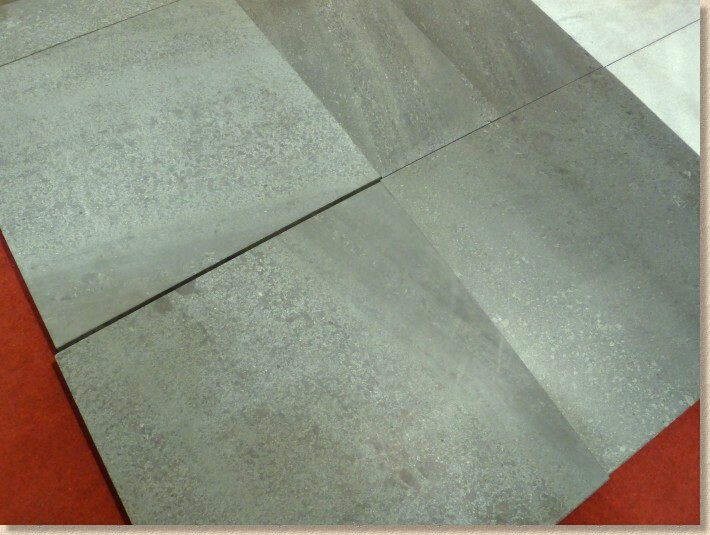 Earlier, I said there was no Irish stone presence, but there was an Irish-based exhibitor in the shape of Tobermore, but they opted to show a reconstituted granite-effect concrete paver! This seems to have caused a frisson of concern amongst several stone industry veterans to whom I talked, who viewed this, and the presence of a sprinkling of ceramic products, as encroachment on their territory. I tend to agree that a simulated stone is not really playing the game at a show of this sort. 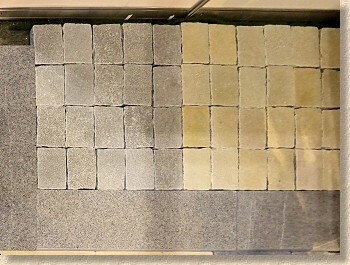 There is no shortage of opportunities to exhibit concrete paving, and besides, Tobermore do have their own range of stone products, so the decision to go with a CBP seems strange. 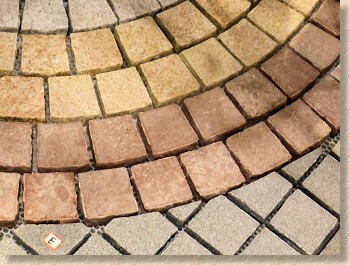 And once again with Tobermore, I didn't recognise a single face! There was another Irish exhibitor, but they were not showing stone. Joint-It are an Irish manufacturer of polymeric jointing materials, wholly produced in County Galway and experiencing something of a surge in interest over the last twelve to eighteen months. Director Martin Fox tells me that now have sixty distributors in mainland Britain and the little factory in Tuam is working full time to keep up with demand. They've also taken on a full time British-based sales and technical rep in the shape of John Irving who brings decades of experience with him. 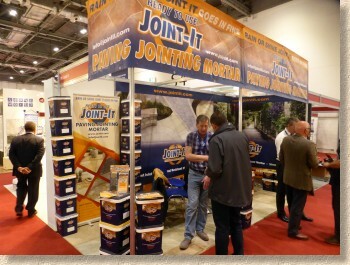 Joint It As the only resinous jointing material supplier at the show, they had the floor to themselves, and in the twenty minutes or so I was with them, the stand was never less than bustling, with scores of enquiries. Their simple-to-use, tip-it-out and sweep-it-in range has three colour options and has been picked up by the largest paving manufacturer in Ireland for distribution via all its outlets. There's to be more of a promotional push on this side of the water, too, in the coming year, and with their keen pricing and authoritative technical support, expect to see Joint It taking more and more of a share in this ever expanding market. The remaining exhibitors worthy of note are all suppliers of what we might think of as accessories to the stone trade. Ardex and Mapei provide bedding and jointing materials – I'm *still* waiting for Mapei to call as they promised me two months back at EcoBuild, and have a discussion about suitable materials for ceramic paving. Once again, no-one capable of answering my fairly simple questions at the time of my visit to the stand. And then we have the sealants. It seemed that every third stand was flogging a sealant of some sort. I know they are regularly viewed as de rigeur for internal applications, but why have we reached a point where sealants are seen as essential for external paving? Of course, they do have their uses and they can make sense for some projects, but over the last five years, we seem to have developed a belief that external paving *must* be sealed. Is this a reflection of our enhanced use of inferior stone, or peoples' desire to keep everything preserved in aspic? I'm sure the likes of Dry-Treat, Lithofin and LTP don't care why the market has such an appetite for sealants; they're just grateful recipients of the trade, and at least they each manufacture quality products. With so much dross on the market, so many 'jack-of-all-trade' multi-surface sealants, so many thinned-to-buggery-and-beyond basic acrylics being flogged by DIY sheds and auction sites, it's important that we do have reputable companies for those projects where a sealant is genuinely warranted. So: there we are. 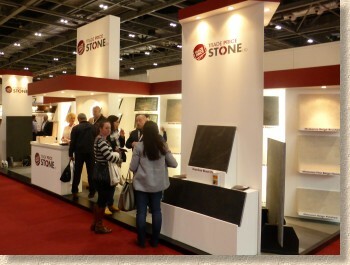 The Stone Show done and dusted for another couple of years, and looking back at it now, it was actually a worthwhile trip. I didn't have the time to take advantage of an excellent menu of seminars spread over all three days – to do so would require a costly overnight stay – and I would have liked to have spent longer discussing the educational and training aspects of the industry. I didn't get to see everything and everyone in the 5 hours I had, but I did get to see enough. 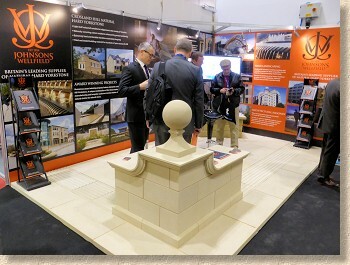 Yes, it's a pity that the big names in the British and Irish stone industry were not on show, but hey! We managed without them and the loss is primarily theirs. They missed a pretty good show!